[S4999] Website UK Government Probate Search Service: PASK, Dorothy Muriel Valentine of 47 Quilter Rd Felixstowe Suffolk died 27 February 1978 Probate Ipswich 4 May £13261 781004470P. [S4] GRO Indexes to Deaths. "1978/Q1 PASK, Dorothy Muriel V. 14 FE 1900 Ipswich 10 3098." [S3] GRO Indexes to Marriages. "1941/Q3 PASK, Donald V. MILLER-MEAD OR KNIGHT Westminster 1a 1019." [S3] GRO Indexes to Marriages. "1941/Q3 MILLER-MEAD, Dorothy M. V. PASK Westminster 1a 1019." [S3] GRO Indexes to Marriages. "1941/Q3 KNIGHT, Dorothy M. V. PASK Westminster 1a 1019." [S4999] Website UK Government Probate Search Service: PASK Donald Victor of 75 Page St London S.W.1 died 30 March 1968 Administration London 24 April. £1283. Further Grant Ipswich 7-2.1979. [S4999] Website UK Government Probate Search Service: PASK, Donald Victor of The Westminster Arms 75 Page St London SW1 died 30 March 1968 Administration lpswich 7 February £274 Former Grant Principal Registry 24 April 1969 791001037V. [S4] GRO Indexes to Deaths. "1968/Q2 PASK, Donald V. Ipswich 4b 899 age 58." Children of John PASK and Sarah PASK née ? [S4611] E-mail from Erica Lander to Stuart & Teresa Pask dated 26 November 2012. 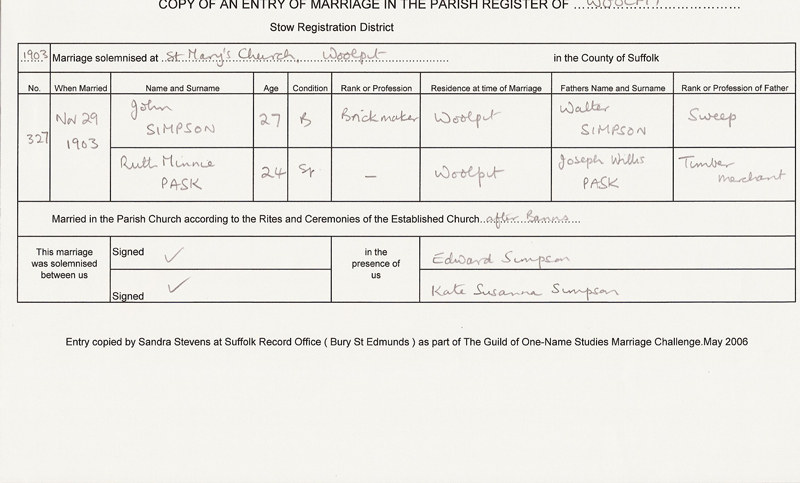 [S2178] Transcript of the marriage of Henry Pask and Anne Sophia White, 27 March 1874. Kindly provided by Sandra Stevens - GOONS Marriage Challenge. [S2179] Image of the 1861 Census for Lawshall Green, Lawshall, Suffolk: RG9 Piece 1132 Folio 130 Page 11. Indexed incorrectly under the name of VASKE. [S2183] Image of the 1891 Census for Rattlesden, Suffolk: Piece 1455 Folio 76/77 Page 12-13. [S3] GRO Indexes to Marriages. "1874/Q1 PASK, Henry Stow, S. 4a 659." [S3] GRO Indexes to Marriages. "1874/Q1 WHITE, Anne Sophia Stow, S. 4a 659." [S2182] Image of the 1881 Census for Rising Sun Inn, Rattlesden, Suffolk: RG11 Piece 1848 Folio 88 Page 14. Indexed incorrectly under the name of PASTIE. [S2185] Image of the 1901 Census for Rising Sun Beer House, Rattlesden, Suffolk: RG13 Piece 1760 Folio 72 Page 5. [S3519] Image of the 1911 Census for Rising Sun, Rattlesden, Woolpit, Suffolk: RG14 Piece 10861 Schedule 120. [S4] GRO Indexes to Deaths. "1918/Q4 PASK, Henry Stow S 4a 2007 age 66." [S2186] Transcript of the marriage of Joseph Herbert Simpson and Catherine Emma Pask, 20 June 1901. Kindly provided by Michael Debenham - GOONS Marriage Challenge. [S2184] Transcript of the marriage of George Ever Pask and Mary Ann Currey, 19 April 1902. Kindly provided by Sandra Stevens - GOONS Marriage Challenge. [S2187] Transcript of the marriage of Ernest Thomas Holden and Annie Elizabeth Pask, 14 October 1911. Kindly provided by Sandra Stevens - GOONS Marriage Challenge.